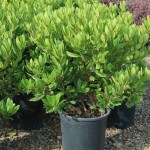 An evergreen shrub with leathery dark green leaves. The late fall blooms are white, bell shaped, and held in 2" long panicles. The 1" diameter orange-red fruit ripens the following fall. It will take drought and poor soils. A useful four season evergreen shrub. It may be pruned as needed.